Israel In Prophecy » Poljak/Abram Poljak, by Ludwig Schneider? It could be that Abram Poljak would not have wanted a biography of his life and work, for his friends knew him as a humble person who hated every personal glorification. At his meetings he said, "If you come because of Poljak, you can stay home!" On the other hand, the name Poljak keeps coming up when Christian groups of Israel friends think about their origins. The older ones like to think about Abram Poljak because in his language, attitude and calling he was like a prophet of Israel. Now in the thirtieth year since his death we want to present something about him and his "message of the kingdom" to the younger generation. Abram Poljak was born in Jekaterinoslav, Russia. As an 8-year-old prodigy he played his violin for the Czar. In his old age he joked, "I was a miracle child. The miracle passed but the child remained." He went to Germany as a youth and worked there later as a journalist and theater critic. That period led to his view that "the Bible explains the newspaper and the newspaper interprets the Bible." In 1933 he was arrested by the Gestapo. In prison, he as a Jew accepted the messiah Jesus. His political articles were Biblical and his sermons political. His publications testify to this, e.g. "Faith and Politics", "Hitler as General and Spiritist" and "The world situation in the light of Biblical prophecy." When asked where he lived he said, "In the train!" because he was constantly traveling for lectures. "When I was on the Mt. of Olives near Jerusalem in 1935 I realized that my life calling was the Jewish Christian work. The goals were before my eyes but not the path. This became clear only with time. In the year 1935 two friends and I founded the 'Jewish Christian Union' in Jerusalem. One of the friends soon left me and the other died. In 1936 I attempted to bring this union to life in Vienna. I found a number of supporters but the Austrian government forbade the founding of this work. “In early 1937 the work gained a foothold in Switzerland under the name 'International union for Jewish Christian settlement in Palestine'. Several months later, in the fall of 1937, the first group was formed in London under the name 'Jewish Christian Union'. During the years 1938 and 1939 the Jewish Christian Union spread in eastern Europe and America and gained spiritual depth. After my internment in May 1940 (in Canada, for Zionistic activity in Palestine) our settlement and our publishing house in England collapsed. There was no further development until I returned to London in March 1944. When the Jewish Christian worship services began in London, the 'Christian Synagogue' (as some said) or the 'Jewish church' (as others said) appeared. We called the work 'The Jewish Christian Church'. “A year later, in the summer of 1945, the Jewish Christian Church was expanded with the acceptance of gentile Christians. In addition, an outer circle was formed. The outer circle was called 'Jerusalem Fellowship' and the whole Jewish Christian work was called 'Jerusalem'. The term 'Jewish Christian Church' was not dropped, but was applied to the inner circle. Thus we now have three names: 'Jerusalem' - the total Jewish Christian work, 'The Jewish Christian Church' - the inner circle, and 'The Jerusalem Fellowship' - the outer circle. The inner circle has a particular calling in Israel and forms the core and the leadership of the 'Jerusalem Fellowship'. The outer circle has its calling among the gentile Christians." 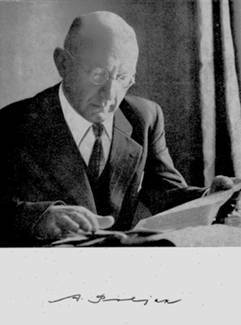 On Pentecost 1947 Poljak founded the first messianic congregation in Jerusalem. At first there were only 12 members, among them Baruch Karniel and Moshe Ben-Meir. Baron Albert von Springer led the congregation because Poljak saw himself more as an ambassador of Christ to the nations. Poljak's attempt to unite all the Jewish Christians in Israel in an alliance failed. In 1951 he left Israel for Germany in order to bring the "message of the kingdom" to the German people, who had so sinned against the Jewish people. This was a special mercy of God for Germany, leaving marks of blessing that are still visible. Underneath the banner with the cross in the star of David, Abram Poljak proclaimed his message of the kingdom in Germany. Germans who had previously dissociated themselves from their fellow citizens who had to wear the yellow star of David now came in droves to hear a Jew who called to them clearly but without vengeance, lovingly but warningly, "Whoever blesses Israel will be blessed. But whoever curses Israel will be cursed!" One cannot "apply" for the kingdom brotherhood. We are not an organization and have no membership lists. We are a movement whose origin is in eternity. Only those whom the king himself has called, "chosen before the creation of the world" (Eph. 1:4), belong to it. One thus cannot gather members, or instruct them or educate them because "they will all be taught by God" (John 6:45). They are "gifted", they have an inner vision, they know what it is about and they wait only for the key word, the sign. We have the sign, a flag, which is the cross in the star of David. What does this flag mean? The cross is the sign of Christ, the sign of the king. The star of David is the sign of Israel, the sign of the Jews. The link between these two signs, the cross in the star of David, symbolizes the returning king of the Jews. On the cross to which Jesus was nailed was a tablet with the words "Jesus Nazarenus Rex Judaeorum (Jesus of Nazareth, King of the Jews) - INRI". At Golgatha Jesus left this world as sacrificial lamb. He will return in glory as the king of the Jews. On our flag the sign is white on a dark blue background. Why is our flag fabric dark blue? Because this is the color of the night sky and because a star can shine only in the night. Christ is our bright morning star (Rev. 22:16) and will return as king of the Jews. All Christians will agree to the bright morning star, but most will want nothing to do with the king of the Jews. Therefore the "king of the Jews" is the test for everyone. One of the surest signs that one is a child of God is our attitude toward the Jews. The cross in the David star is the sign of the Jews who believe in Christ. It has therefore become the test for Christians. It has already caused divisions in churches, fellowships and families and it will continue to do so until the culmination. There our paths will diverge - and "under this sign we will overcome". At the end of this time only two flags will remain opposite one another: the flag of the Jewish king and the flag of the anti-Christ. Whoever does not count himself part of the Jewish Christian church and the kingdom brotherhood (those who wear the cross in the star of David), will end up with the anti-Christ - just as many preachers of the gospel, with all their Bible knowledge, ended up with Hitler. We repeat: One of the greatest signs that we are God's children is our love for the Jews. And one of the greatest signs that we are children of the devil is hatred of Jews, anti-Semitism. Whoever hates the Jews ultimately hates his own people as well and abandons them to destruction, as Hitler proved. We do not say that one should love the errors of the Jews. We cannot overlook these, but a true Christian will not be blinded by them, he will not generalize. He will be just. If he sees in a Jewish villain a child of the devil, that will not stop him from seeing God's people in the Jewish people. The true Christian will never forget that "salvation comes from the Jews" (John 4:22), that the Jews brought the Bible to the nations, that Jesus, the Apostles and the prophets were Jews and that Jesus will return as king of the Jews - that his kingdom will spread from Jerusalem to the whole world. A true Christian believes the words of the prophet, "When the Most High gave the nations their inheritance, when he divided all mankind, he set up boundaries for the peoples according to the number of the sons of Israel. For the Lord's portion is his people...He guards him as the apple of his eye" (Deut. 32:8-10). "In those days ten men from all languages and nations will take firm hold of one Jew by the edge of his robe and say, 'Let us go with you, because we have heard that God is with you'" (Zech. 8:23). "In those days...when I restore the fortunes of Judah and Jerusalem, I will gather all nations ...I will enter into judgment against them concerning my inheritance, my people Israel...I will return on your own heads what you have done" (Joel 3:1-2 and 7). From Joel's words it is clear that God will judge the peoples according to their attitude toward Israel. These words are always in front of the eyes of a child of God, making his heart glad. But they are like a red flag to the children of the devil. Love and hatred do not proceed from the intellect, but from the heart. A.P. The lexicon for "Religion in History and the Present" (J.C.B. Mohr, Tübingen) mentions Poljak's work but regrets that "it never grew beyond the small beginnings". In a sense this is correct and is confirmed by a visit to Poljak's center in Möttlingen (Germany). Not far from Stuttgart is the small town of Möttlingen, with 1,000 inhabitants. Poljak was brought to Möttlingen by his co-worker Gottfried Müller, who considered it a "holy place". I entered the old church and read above the pulpit, "The revelation awaits an appointed time...The righteous will live by his faith" (Hab. 2:3-4). The evangelical Pietist pastor Johann Christoph Blumhardt (1805-1880) worked here from 1838-1852. Blumhardt became known due to his successful battle against Gottliebin Dittus' demon possession. On the house where this battle took place we read, "Man, think of eternity and do not disdain the period of grace in which judgment is no longer far off". In Möttlingen pastor Christian Gottlob Barth (1799-1862) wrote his hymns and published the Pietistic "Youth Pamphlets". In 1855 Friedrich Stanger was born in Möttlingen as an illegitimate child. He was converted at the age of 50 and was set free from alcoholism. "Father Stanger" then founded the Christian rest home "Salvation Ark" in 1909, which still operates in blessing. I walked slowly around Möttlingen looking for the Jewish Christian settlement, [ the "Hebräer-Buckel", (the Hebrew hump) as the locals call it]. But the streets are empty. The only persons I can ask are some Moslem women, as I recognize by their religious head scarves. I then found the Patmos settlement, where Abram Poljak had worked. It has its name from the end-time revelation of John, who was on Patmos when he received it. The first house is named "Zion" and is still inhabited by Erich and Maria Klink. They revel in memories when they think of the days of Abram Poljak, whom they nick-name "Bram". On the same street I found the economy building "Shalom", the separate house "Hope" and 5 semi-detached houses, which an older brother cares for. The Patmos Publishers, which spreads the posthumous writings of Poljak and of the Jewish Christian church, is also there. Today Möttlingen is still called "the mercy place of the evangelical church", not only because of Blumhardt, Barth and Stanger. This refers also to the Nazi Jewish persecution and especially to Poljak's service in the post-war period. During the 1950's, 500-600 persons traveled to Möttlingen to hear the message of the kingdom. On their way to the Patmos settlement many shoes got stuck in the mud of the still-unpaved street, so that they often arrived barefoot, as if the ground there were holy. In the large meeting hall, previously called the tabernacle because it is covered outside with reeds, the blue flag with the cross in the star of David still hangs. Poljak's organization no longer exists and the Patmos settlement is up for sale. Baron Albert von Springer, who now lives in Switzerland, wants to close everything in a financially positive way. But Poljak's message of the kingdom still lives, passed on like a relay by various Israel friends' circles. In churches and fellowship there are circles who support Israel with prayer and donations. If one asks how they were founded, one hears, "Before the war there was a Jewish Christian named Abram Poljak..." These circles took over not only Poljak's message, but also his inheritance. For then as now these Israel friends often stand alone in their churches and fellowships, rejected by preachers and pastors for whom the Jews are still a red flag. Before I left Möttlingen I once again walk through a small cemetery. A large wooden cross at Stanger's grave is engraved with the words, "Jesus lives, Jesus overcomes!" I suddenly stopped short, for I saw the cross in the star of David on 13 graves. The deceased belonged to the Jewish Christian church. Among them one can also find the grave of Abram Poljak (March 28,1900-October 28, 1963) and of Agnes Sara Waldstein (May 3, 1900-August 18, 1961). The prophet Poljak was a man like us with all the pluses and minuses. His call to Germany was God’s grace for the German people that found much too little recognition.